Silver glass is the latest rage in expensive supplies for lampworkers. At $50-100 per pound, it's something you want to use wisely. Unfortunately, unless you know the tricks, it can look like scrap glass. I have invested in a variety of such silver glass, mostly from Double Helix Glassworks and Precision 104, made by Northstar, although there are other choices as well. After having some success and more failure with working the silver glasses in my stash, I finally decided to become a bit more systematic in my study. Five months off the torch will do that to you. Did I really believe that I would remember what I used for certain beads??? Or exactly how I handled the glass to get that cool effect instead of mud? Alas, I stand corrected. Here's my first pass at preparing samples. 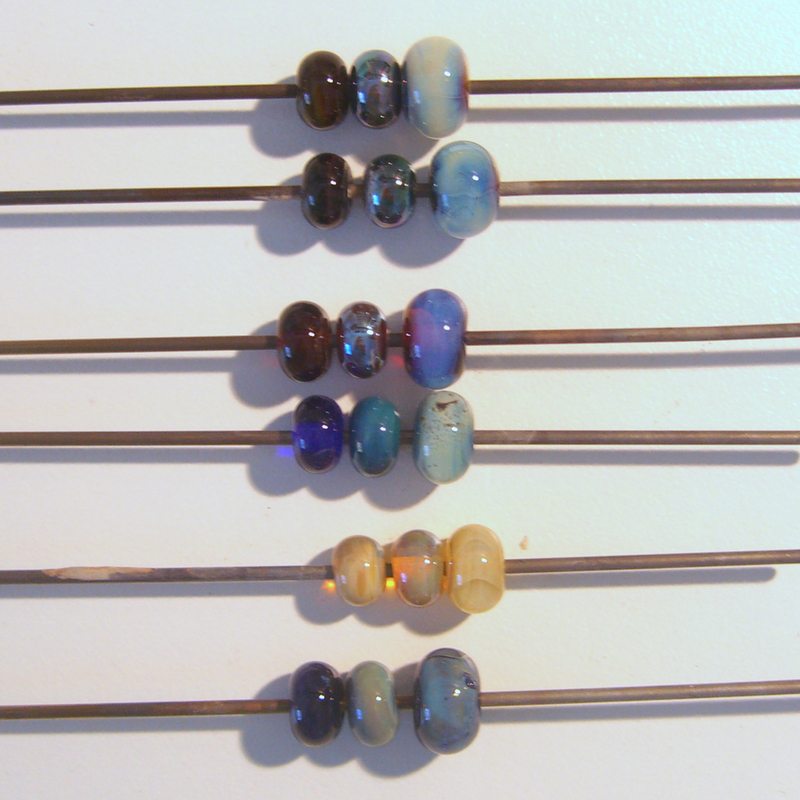 I made three small spacer beads of each glass, one left plain, one reduced, one reduced then encased. Of course, now I've been reading up a lot more on silver glass, so I know that I need to do even more experiments. I also need to make samples for other colors in my stash. Stay tuned. 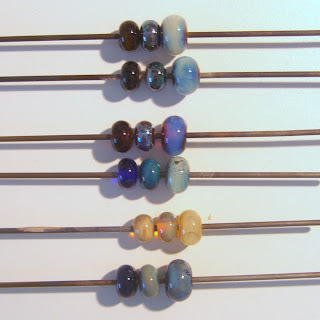 you did a good job on Silver Glass ☺, I am admiring everyone making test beads because I don´t have the patience for. Every time I want to do it starting with a spacer I end up with a bead ☺☺☺. But I guess it is good so because ... working it over one hour is another thing than making a spacer and that is what I want to know .... how would it look like after one hour?